This is the summary of consumer reviews for Whirlpool Gold Front Control Dishwasher with Stainless Steel Tub (Model: WDF750SAYM, WDF750SAYW, WDF750SAYB, WDF750SAYT). The BoolPool rating for this product is Excellent, with 4.50 stars, and the price range is $596.50-$749.00. 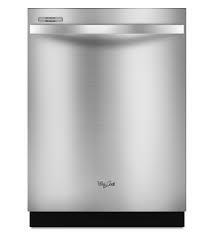 The Whirlpool Gold Front Control Dishwasher comes with a stainless steel tall tub that adds a sleek, smooth texture to the interior and provides higher heat retention to further improve drying performance. 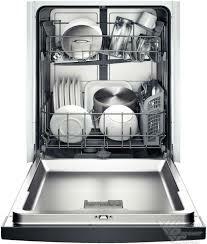 This dishwasher really washes and dries your dishes so that they come out sparkling clean. 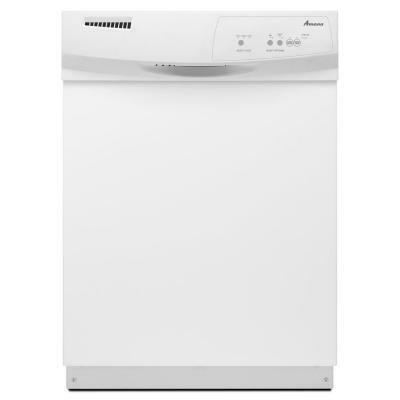 This dishwasher runs very quietly and with its several wash cycles, you can choose the best option you want for your dishes. A virtually flush door with a shorter 2-1/2" console adds a modern look to your contemporary kitchen and is easy to clean. This dishwasher features a Quiet Partner™ IV sound package, the highest level of quiet operation and sound-reducing insulation for a very quiet operation. Additionally, with the AnyWare™ Plus Silverware Basket, you can rearrange your dishwasher to one that you'll be most comfortable using. However, some users may find the narrow divider of the top rack a bit troublesome. According to some user reviews, the silverware baskets is smaller as compared to other dishwasher's silverware baskets. 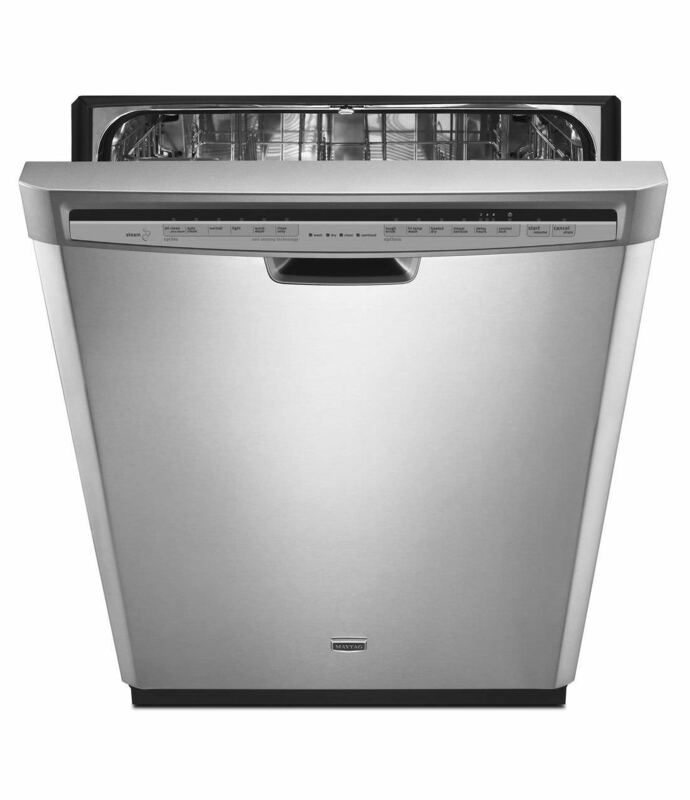 Overall, the Whirlpool Gold Front Control Dishwasher with Stainless Steel Tub is highly recommended by users for its quality, features, and looks. This dishwasher is as beautiful on the inside as it is on the outside. Not only does this model fit seamlessly in your kitchen, it'll also fit your lifestyle. Dishes are really clean, shiny, & dry. The dishes come out perfectly clean. I also love how clean my dishes are! Overall the dishes and glasses come out clean. Good product, cleans the dishes as it's suppose to. Very quiet, and seems to clean all of the dishes. It cleans well and has a lot of space for dishes. The soap loading dish stays shut...our previous dishwasher was always popping open. It cleaned our dishes better than the old one we'd!. 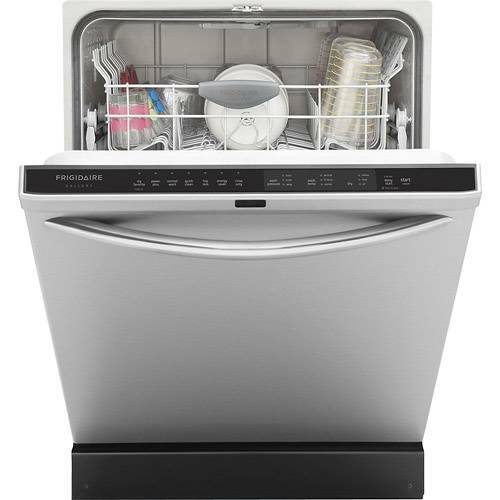 very quiet,reccomend this dish washer,nice fit & finish inside & out. It runs so quiet and my dishes come out sparkling. NIce and quiet, cavernous interior, and easy to load. Dishwasher is quiet, can stand right next to it and barely hear it. Our dishes always come out very clean, and the unit is very quiet. The quiet operation ws by far the biggest surprise. It's so much room and is so very quiet. It's large, easy to use, and so quiet my wife continually checks it to make sure she started it. All that the description said it was and it's extremely quiet. great proudly made in usa quiet operation but leaves glasses wet after cycle is done after drying. The top rack and bottom rack are awkward to use. Install was was easy, operates easily, like the silverware rack in the door, and is oh so quiet. 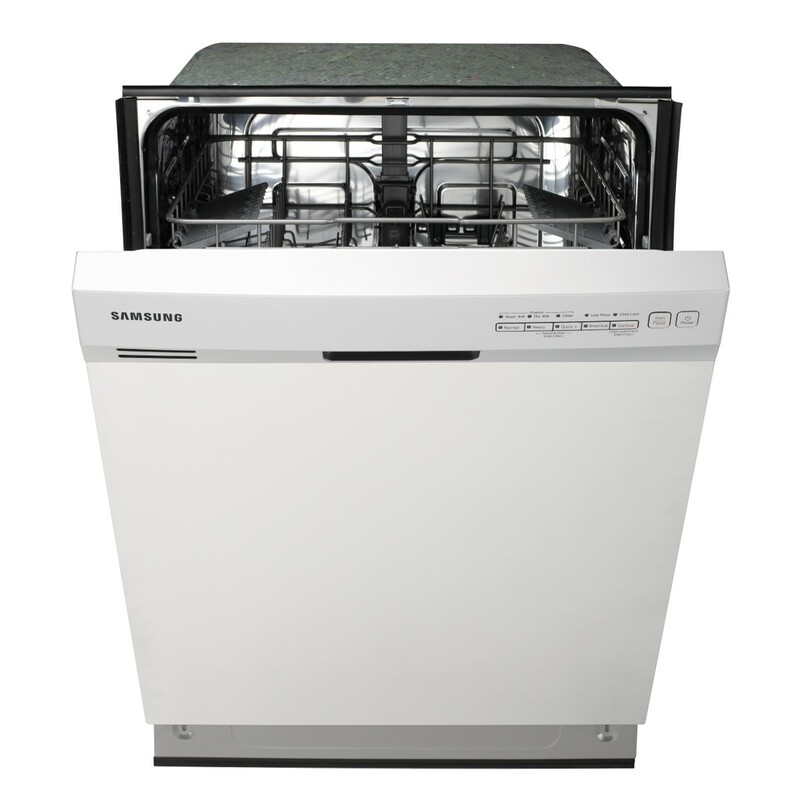 Nice features include: all stainless steel (inside and out); on-door utensil rack; half-row of built-in stemware braces on upper rack; fast or eco wash modes, including delayed start; very quiet. Pleasantly surprised with the quiet operation, versatile racking, and ease of operation. 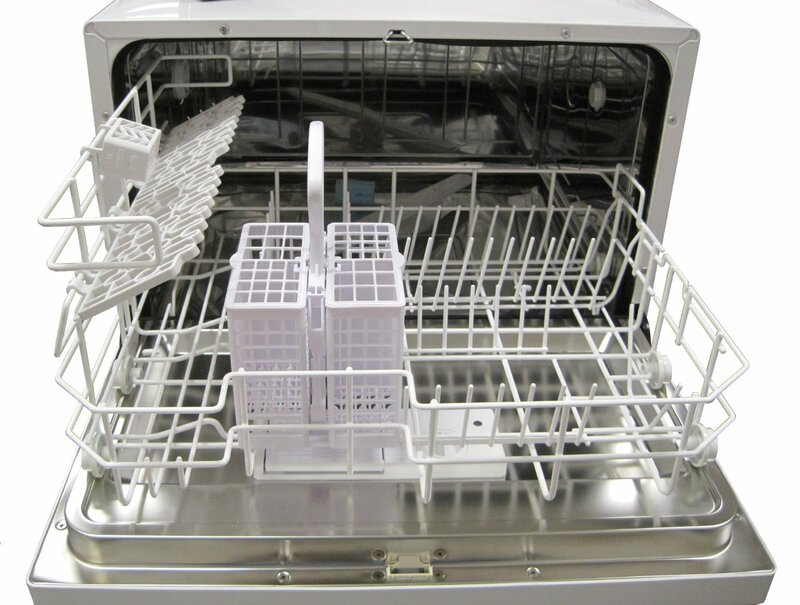 The divider design of the top rack is a little to narrow.Overall, the machine washes very well, is very quiet operating and we're very satisfied with this dishwasher. We moved the silverware rack to the side and now the bottom rack holds a lot more. I've trouble with the silverware rack on the door. We've found that it's much easier to use the moveable silverware rack along the left side of the lower rack. And there seems to be more space on the bottom rack for plates, bowls,etc. On first wash, detergent packet wound up in basket on end of lower rack!. Has several wash cycles including a one hour cycle. This's a quiet unit, and washes the dishes well. I love the way it cleans, I NEVER take a dirty dish out after a cycle has washed. I also like the different wash cycles. We tried the various wash cycles (with dishes et al just lightly rinsed )with excellent results. THIS DISHWASHER DOES A GREAT JOB WASHING DISHES. 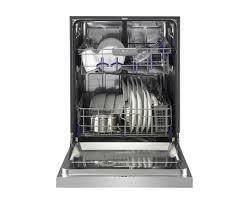 It also gets dishes etc just as clean as our previous dishwasher by just using the ECO cycle. The drying cycle is 50% better than our previous dishwashers. Has a few less wash cycles than our previous unit. Cycle time is too long. Still, it was too narrow to hold a day's worth of silverware for our two-person household, knives fell sideways through the holes inside it, and my silverware handles didn't all fit through the slots in the basket covers. Only negative on this dishwasher is the small silverware basket. We retrieved the silverware basket from our old Kitchenaid DW, which solved the problems. I read in a review and it's true that the silverware baskets & location (on the door) are stupid and flimsy. Also, the handle for the silverware basket is "bent" apparently so you can get it out of the door, but I prefer to use it in the bottom rack, so now the handle impedes getting silverware in and out. The overall performance is excellent but, the silverware basket and upper drawer are too size and shape specific. --The silverware holder is useless. The stainless steel looks sharp and we like the silverware basket on the door allowing for more room on the racks. We thought we'd have problems with the flatware baskets but the design fit our needs...just as convenient as a rectangular basket from previous washer. 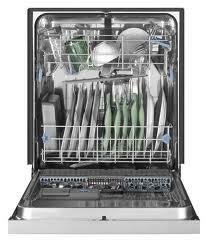 I have a Model WDF750SAY Serial # F41215752 Whirlpool dishwasher I doesn't dry the dishes. I have tried all the different settings. I was told to open the door after the dishes were washed to let the steam out. I have never had that before. What could be wrong? I really don't like the machine for this quality.